The June 2015 Wednesday Over Water (or WOW) garnered inspiration from the temporary exhibition Fish Stories: Game Fishes of North America; and much like the exhibition, the night’s food, stories, and insights offered a broad scope of tall tales, delicious foods, and an interesting cocktail…that almost got away. Special guests included library director Catherine Peterson, Chef Melody Lane of the Great Hall kitchen, and Ed Javorsky, host of a popular radio show. I was happy to disclose my family hushpuppy recipe as a starting point to the evening as Catherine Peterson offered insights into the nuances of the Fish Stories exhibition. Chef Melody Lane made her first-ever appearance at WOW (and certain NOT to be her last), discussing her time as a fishing guide off the coast of Belize, and also her appreciation of the work of Japanese artist, Mineo Yamamoto, a master fish printer. WOW guests were also served several interesting exhibition-inspired foodstuffs, which included our version of a Trout Cake with a Mississippi Comeback Sauce—that’s a “kissin’ cousin” to the more-traditional remoulade sauce, but made with just a whisper of chili sauce. It’s a must for anyone traveling through Mississippi when dining on fried fish, shrimp, or pretty much anything that could use tarter or remoulade sauces. Finally, we allowed guests an opportunity to imbibe in something we like to call the “Pond Scum Cocktail” which features Tito’s vodka from Austin, aloe vera juice, fresh mint, and hydrated basil seeds that have a look not at all unlike that of tiny black fish or frog eggs. Interesting to look at…delicious, refreshing, and fun to drink. Give it a try at your next High South dinner party…it’s sure to WOW! 1 can corn – drained 2 cups corn meal 3 cups flour ½ cup sugar 3 eggs – beaten 2 tsp. salt 1 chopped onion 4 cups milk Drop heaping teaspoons in deep fat and fry until golden brown. Combine trout, green onion, capers, lemon peel, and pepper in medium bowl. Season with salt. Stir in egg, cream, and 1/2 cup bread crumbs to blend. 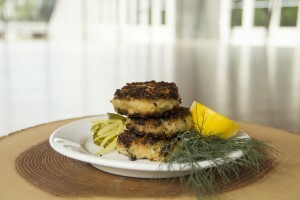 Form mixture by hand into eight 1/2-inch-thick fish cakes. Place remaining 1/2 cup bread crumbs in a shallow dish. Roll trout cakes in bread crumbs, coating completely. Heat 2 tablespoons extra virgin olive oil in a large skillet over medium heat. Working in batches, and adding more oil as necessary, fry trout cakes until golden brown, about 4 minutes per side.